It may come as a surprise to you that yoga can help you to lose weight. Although the practice doesn’t allow you burn a lot of calories, it has its place in weight loss. The ancient practice of yoga has many physiological effects that have been used for centuries. One of its capabilities is to keep the body fit and strong. It does this in a variety of ways and hits the entities that live within you. Here are 5 reasons yoga can help you to lose weight. The mind and body can change in subtle ways but create great change. Yoga was designed to tap into your mind through various poses. Certain poses will relax the mind which sends messages to muscles to also relax. You also change the way the mind perceives reality. The cycle of the body changing the mind can equate to the mind changing the body. You’ll also be much less likely to binge and purge. To abstain from eating and then eating every fattening thing you see in the kitchen. Yoga allows you maintain a more centered outlook on all aspects actually. One of the yogic benefits and how it alters your mind positively is that you can focus better. You are more likely to relax so you won’t emotionally eat to stave off stress. As yoga has been proven through studies to help control stress reactors in the brain, it explains why it’s a healthy diet alternative. It doesn’t matter if you do the most intense workout or long, restorative poses. One of the main contributing reasons we will gain weight over and over is due to this self-defeating prophecy we go through. We want to lose weight and so we try everything. We push ourselves to new limits all of a sudden and expect this to work. When it doesn’t, we will often beat ourselves up. When you do that, you will probably head to the fridge and emotionally eat. Then you feel guilty and you may just eat more. It’s an evil cycle. The key may be to focus on a compassionate relationship with yourself for weight loss success. Yoga helps you to go within and form a meaningful relationship with yourself. You’re going to be a lot less prone to beating yourself up. You may even care less that your dress doesn’t fit quite right at the moment. Feeling the inner sense of self will allow you to see that you’re not just the body you inhabit. That may alleviate the stress you put on being this perfect person on the outside. When you rely less on how you look on the outside, you’ll make healthier decisions. You won’t starve yourself or overeat. You’ll be able to center yourself which will center your behaviors. When you get into doing yoga at home, you can often stave off cravings that may cause you to binge. For example, if you really want chocolate ice cream, tell yourself you can have that treat. The deal is to first head to your yoga mat and do five minutes of yoga. A sun salutation, one pose of deep stretching or just hanging out in child’s pose for five minutes. If you do still want that ice cream, you’ll likely just take a mindful scoop and enjoy every little lick of it. This replaces old habits of filling the bowl full of ice cream, eating it all rapidly and not enjoying it. How you eat food is as important as what you eat. 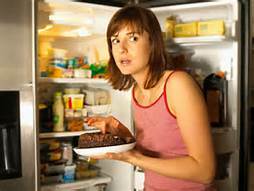 When you mindfully eat a treat as opposed to allowing it to have control over you, you can enjoy it. Why do we have weird cravings at home? It is in our home where we will let down the walls that we put up in the outside world. This can allow us to let go of our emotions. While it’s a good thing, sometimes, we’ll use instant gratification to handle these heavy emotions. Some might drink, some might smoke, and some will eat. Eating to repress painful emotions will only make you feel worse. So when you use yoga as a way of coping with emotions, you lessen the desire to emotionally eat. Yoga is often just the beginning of someone’s journey to optimum health. If you finish a yoga class, you have a wonderful buzz going throughout your system. Eat a chocolate bar and you kind of kill that really blissful feeling. You will get to the point where the risk (eating badly) isn’t worth the little sugar buzz you get from it. Yoga will cause you to crave different foods. Instead of chocolate, you’ll want pure foods that have been kissed by the sun or hugged by the earth. You’ll want salads and root vegetables. You’ll crave fruit like mangoes and bananas. Your journey to health and wellness starts with yoga. The rest will follow if you commit to a regular class. It’s okay to eat something sinful from time to time. It’s just important that it doesn’t control your life. The melting of belly fat via yoga does not insinuate you have to do plank pose daily. Actually, the act of any kind of yoga will help you burn belly fat. Why? Fat will collect on your belly due to physical manifestation of your stress. The less you stress, the less fat you’ll collect. Here’s how it works. The rise of the stress hormone, cortisol, is what causes that belly fat. Yoga reduces cortisol levels so when you do workout, you’ll have an easier time shedding fat from the belly. The slow, kind practice of restorative yoga is one of the best ways to burn fat from your body. It is the slow stretching poses that work magic on the body. You will experience the benefits the more you practice and the longer you do it. The mind, body, and soul all feed off one another. Yoga reunites all of these aspects of you in a harmonious way. 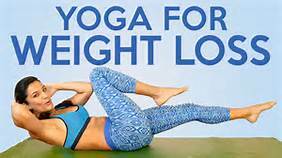 Basically, yoga will help you lose weight in indirect ways (the mind and soul) as well as directly via the body.